The free product is said to have run out due to popular demand. KFC have unveiled their own sunscreen, and we can't work out whether it was a massive joke or not. The fast food chain - who are famous for Colonel Sanders and fried chicken - turned their hand to sunscreen for a limited time only. Fans need not worry that they've branched out too far, however, since the the company promises the sunscreen smells just like fried chicken. The ad, which features the "extra crispy" colonel, George Hamilton, also directs fans to an actual website, where we are reliably informed that they've all been swooped up. 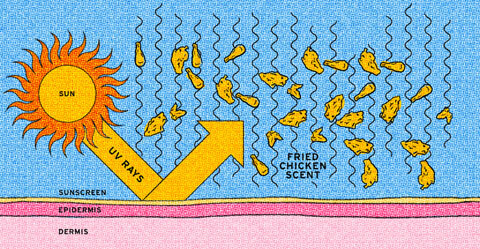 More importantly though, there's a diagram which explains just how the cream keeps the sun's harmful rays out and the fried chicken smell in. Despite it smelling finger lickin' good, the website insists it must not be eaten, writing: "Sunscreen is an actual product. KFC® Extra Crispy™ Sunscreen is not a food product. NOT a food product. Do not eat this product. Even though this product smells delicious, it is not delicious. The only skin that should be extra crispy this summer is on your fried chicken."